What opportunities exist for cross-fertilisation between gender theory and social norms theory? And what constructs can be used with social norms theory to design effective interventions? These questions guided the latest meeting convened by The Learning Group on Social Norms and Gender-related Harmful Practices and held in Baltimore, USA on 27 and 28 July 2017. Increasingly, development practitioners and donors seek to harness insights from social norms theory to catalyse change around gender inequity and harmful gender-related practices. Little guidance is available, however, to help programme implementers to integrate simple norms measures and change strategies within field-based programming. The Learning Group works to fill this gap between theory and its application within development practice. The group brought together thinkers and “doers” who seldom have the opportunity for exchange. 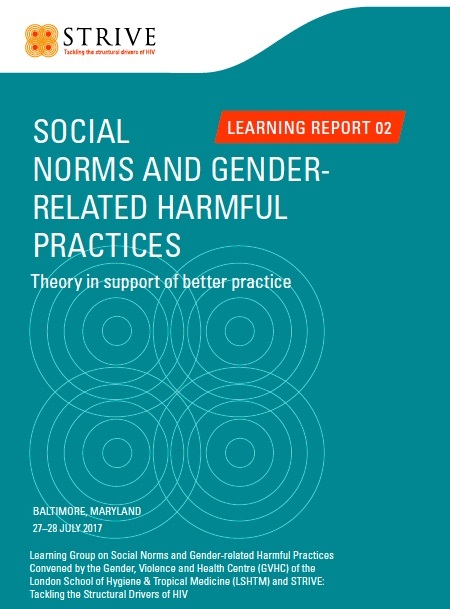 Experts in their fields sought to identify and discuss insights from social norms theory and gender theory that could help transform the norms sustaining harmful gender-related practices. 1. What opportunities exist for cross-fertilisation between gender theory and social norms theory? Practitioners do not need a single and harmonised definition of norms, as long as they use a coherent theory that matches their understanding of the context. The definition and theory they will use, then, will differ according to the purpose of their work. Generally speaking, however, participants suggested that looking at descriptive and injunctive norms as two separate constructs will likely be helpful when designing and evaluating interventions. 2. What key constructs can be used with social norms theory to design effective interventions? It is important to design interventions that integrate social norms within a wider framework. Agency, power, norms and values can be aligned or exert opposite influence on people’s actions. Successful social change interventions should understand how these factors intersect and address them in their interplay. 3. What makes people aware of the norm? Observing an out-group comply with a norm has been shown to reduce the in-group’s motivation to comply. This evidence highlights the dangers of designing a large-scale intervention that targets multiple groups with the same message and strategy. 4. What makes norms more or less powerful? Practitioners’ efforts to understand how norms change need to take into consideration factors that affect the strength of a norm. They should be careful not to assume that a widespread normative belief exerts a strong influence. There exists greater potential for norm change when deviance can be detected by “others” as opposed to when compliance occurs in private. Observing widespread deviance is critical for norms to change. 5. What works to change social norms? Participants discussed three key lessons for social norms interventions. The first is the possible danger of creating a “boomerang effect” with campaigns that emphasise the widespread prevalence of a practice. The second is the importance of “cultural-embeddedness” to the success of normative interventions. The third is the importance of engaging community members as leaders of the change process.